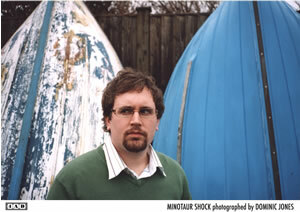 Minotaur Shock is a one-man band made up of Dave Edwards, who has been prolifically composing and remixing in Britain for the last decade. His music is predominantly instrumental and could roughly be called electronic music, but it never lacks for warmth and never just settles into the pocket. Dave put out a handful of EPs and albums on Melodic before merging with groundbreaking label 4AD, who released his last album, Maritime , and will be releasing the upcoming Amateur Dramatics this summer. He has remixed such important artists as Badly Drawn Boy, Bloc Party, Stars, and Snow Patrol. The world Edwards creates within his own pieces is generally uplifting, his complicated beats strung with brass and woodwind instruments. In his own words, he describes Amateur Dramatics as "school band meets Italo meets chamber music rubbing up on electro with a slice of acid, a sprinkling of minimalism and a short attention span. It’s got saxophones, violins, clarinets and the insides of my grandma’s mini-piano on it." I think I’ve changed as I’ve gotten older. When I started making music, I viewed them as a distraction–most of the music I was listening to didn’t have singing, and I liked the fact that it left things open to interpretation. However, it was probably just me trying to compensate for the fact that I can’t sing or write lyrics in any sense whatsoever. Nowadays, it feels more like a handicap, and I am in awe of people who write and sing well. But I guess it means that I need to try harder to make the music engaging, so it kind of eggs me on. I tend to be inspired by a mixture of all four, but probably get the most inspiration from listening to and absorbing music. I tend to have long periods where I just listen to as wide a variation of music as possible, and then at the end of that I’ll decide what I liked best, try to figure out why I liked it and then incorporate whatever it was into my music. That’s quite vague, isn’t it? It’s something I’ve always found difficult. The music I make is primarily based around me sitting in front of a computer tweaking things until my computer decides it doesn’t want to work anymore and crashes. Now that makes for a pretty dull live show. Previously, any live instruments that appear on the records have been played by me and multi-tracked. Which is again tricky to do live unless I grow more arms or rely on looper pedals and the like–but I find them restricting in terms of arrangement (maybe that’s just me not having the patience to learn how to use them properly). More recently, and particularly on the next album, I have been writing music for real instruments, and I guess somewhere in the back of my head there’s the idea that the music could be played live by musicians more talented than I. So that’s the plan. Some kind of amalgamation of live strings, horns, my computer (if it behaves) and I’d really like to get back to playing the drums live. So, no loop pedals. Without giving away any secrets, what are some of the programs or gadgets that you rely on most? I have been using Cubase since a friend gave me an Atari way back. I now run it on a moody PC. I get on OK with the software, and I find that my computer often knows when I’ve done too much to a track so [it] decides to conk out. It’s like an executive producer who knows when I’m going off on one, letting me know that my extended synth solo is, in fact, crap by simply switching itself off in the middle of it. We have developed a pretty good working relationship. However, I am thinking of going mobile and getting me a laptop, which could spell the end of all restraint within my music. We’ll see. I can’t really boil it down to one album–I listened to a lot of electronic music when I was young; I got really into the early Warp stuff (I still play The Black Dog’s Bytes album pretty often). The album that made me want to drum more was PJ Harvey’s Rid of Me . The album that had the biggest impact on me in terms of the way I approached music was Steve Reich’s Music for 18 Musicians . But there are hundreds more that will have pushed me towards making my own music. I miss drumming–if I haven’t played for a while I get a jones in my bones. My drums have been sitting under a blanket in my garage for months now and I need to get them out. That’s probably why I’ve mentioned drumming twice. Sitting in front of a grumpy PC does not give me the workout that smacking drums does–and it’s not quite as satisfying. Anyway, I try to make the rhythm interesting in my stuff, but lately I have been spending far more time working on harmonics and melody, etc. Previously, I concentrated on texture and rhythm, but I am quite enjoying limiting the sounds being used and trying to make that interesting. I started the new album with the intention of using similar sounds throughout, to make it sound more like a whole piece. However, I quickly got bored of that. But the intention was there. Musically, I guess I’m pretty proud of the next album (Amateur Dramatics), as a lot of it was very deliberate, with the intention that the music could be written out on special paper with lines on [it] by people who can actually read and write music. I spent a lot of time thinking about the arrangements and actually "writing" the songs. Previously, I just chucked a lot of elements into a pot and saw what worked. Personally, the fact that my kids seem to be happy most of the time. I guess Bristol has always been a musical city, and a lot of that has seeped into what I do. The obvious ‘Bristol sound’ was an influence although I was slightly miffed when I finally heard the original songs that Massive Attack sampled on Blue Lines . Portishead, I think, are marvelous and can’t wait for the new one. Alongside them were bands like Flying Saucer Attack, Movietone, and labels like Sarah Records–I found that side of Bristol to be equally interesting. Living on the outskirts of Bristol meant that I could easily slip into the countryside, which I guess gives my music a rural kind of quality. Besides that, my dad always used to play Neil Diamond tapes in the car. I guess nowadays I’m more painstaking. The early stages of a track are pretty improvisational, but once I’ve thrown some paint on the canvas I spend ages mushing it all around. Am I allowed to say 1985-1995? That would have been the 10 years that had the biggest effect on me. Prefab Sprout, The KLF, Pet Shop Boys, Wedding Present, Warp, Pavement. I could go on for ages. The ’70s were pretty good, too, mind. Columbo, tea, and my family. Worrying about other people, worrying about money, worrying in general. Scouting For Girls. Headphones that stop working in one ear. The weather at the moment is pretty crap. The usual stuff. What have you always wanted to do but haven’t done yet? Go to Iceland. And Japan. Learn the piano. Put a load of this junk in my house on eBay. Gal Costa. She’s actually doing my head in a bit; I might have to give her the boot in a minute. Or maybe that’s because you’ve made me think about depressing stuff and things I haven’t achieved. Visit Minotaur Shock on Myspace. Posted in Music Interviews and tagged Anna-Lynne Williams, Electronic Music, Minotaur Shock, Solo Musicians. Bookmark the permalink. Trackbacks are closed, but you can post a comment.